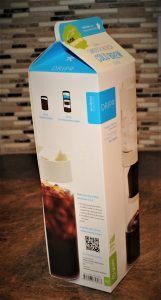 A while back I came across a Lightning Deal for the Dripo Coffee Maker. Of course I had to get one, especially since I had just been researching similar coffee makers for my Dutch Coffee article. 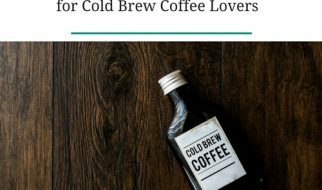 Cold brewed coffee can be made by immersion technique, or by a cold drip technique (Dutch coffee). The Dripo falls into the latter category. The Dripo came attractively packaged in a faux milk carton and is solidly constructed. It is made of sturdy plastic and has a stainless steel mesh filter. 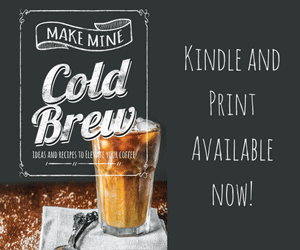 The coffee maker doubles as a travel mug, so you can make your coffee, take out the coffee grounds basket, screw on the travel lid, and go. Set up was fairly intuitive, although instructions were included. Coffee grounds are placed in the grounds basket which contains the mesh steel filter. The filter is very fine and keeps the coffee below from having much sediment at all. Only when I used finer grinds did I find a little bit of sediment in my cup. To use the Dripo, place about 30g of coffee in the basket, and cover with a paper filter. The instructions state that wetting the grounds or paper filter is optional. I tried it both ways (see below for how that turned out). The purpose of the paper filter is to distribute the dripping water evenly throughout the coffee so it doesn’t just channel through the center. Over the coffee basket is a place for the water receptacle. Fill it with ice and water. Screw that on, put the lid on, and let er drip. (Sorry). Within a minute, coffee was dripping through. It took about 4 hours for all the water to drip through at room temperature. It is well constructed—all parts are sturdy. The mesh filter is understandably a little more fragile as it is hard to construct a filter that is both fine and tough. After using it a few times, I discovered there are handy markings on the coffee basket for 20, 30, and 40 g of coffee grounds. 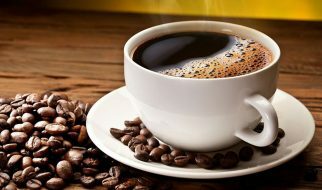 Coffee happens in much less time than with immersion technique, which requires at least 12 hours or more. With the Dripo, it took an average of 4 hours. The filter is effective at filtering out most sediment. I only found some very fine sediment at the bottom of my glass. Easy set up—the instructions are clear, but set up was easy enough that I really didn’t need them. I was glad to have them though after taking everything totally apart for washing (including gaskets and filters). I didn’t use as much coffee as with immersion. 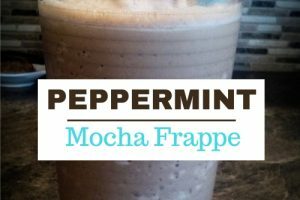 The recommended amount was 30 grams, which was roughly 1/3-1/2 cup. Inexpensive way to get Dutch coffee. 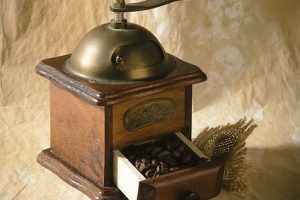 Traditional Dutch coffee makers tend to be expensive, made of glass, and difficult to store due to their size and fragile nature. The size of the coffee maker is also not as tall and cumbersome as traditional Dutch coffee makers. I also liked that you could put the whole thing in the fridge. Lack of control—the length of time it took for the water to drip through was highly dependent on how long it took the ice to melt. 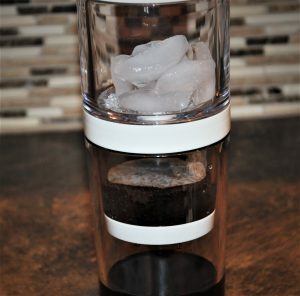 The water dripped through fairly quickly, leaving just ice in the top container. At room temperature, the ice melted in about 4 hours from the start. In one test, I put the Dripo in the fridge overnight and there was still unmelted ice the next morning. There is no way to control the rate of dripping. The instructions state that if it is not dripping fast enough, to loosen the seal between the water reservoir and the tumbler. I tried tightening it to slow down the rate of dripping with no result. Drip rate was roughly 1 drip per second. 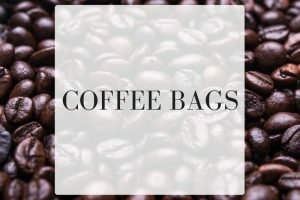 Uneven wetting of the grounds.—I tested several batches of coffee with the Dripo for this review. The first batch I did not pre-wet the coffee grounds and the coffee turned out ready-to-drink but a little on the weak side. After messing with attempts to just barely wet the grounds, I discovered the best thing to do is thoroughly wet the grounds and stir to make sure all the grounds are wet. Some water will drip through immediately. Just dump this water and once your grounds are wet, fill the water reservoir and assemble the Dripo. 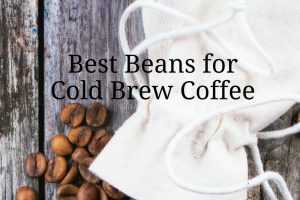 This method made the best coffee in my opinion. I also learned that the best coffee happened when I put the Dripo in the fridge. This slows down the ice melting and yields a stronger brew. There are several parts, including gaskets and filters that make putting the Dripo back together a bit of a puzzle at times. It is not dishwasher safe. Most of the time though, it is not necessary to take is totally apart for washing. 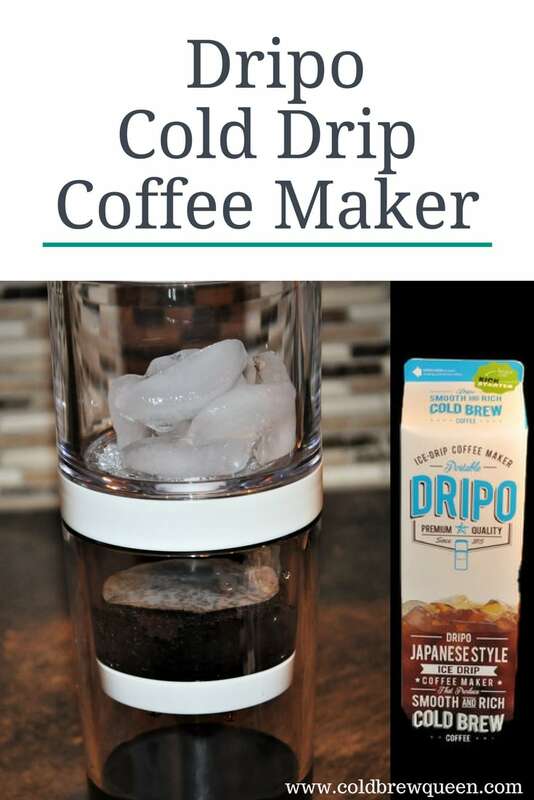 The Dripo is not designed to be used with boiling water, so if you like to make a cup of hot coffee out of your cold brew, you won’t be able to use the travel mug feature. 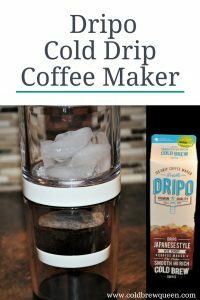 The amount of coffee you can make in the Dripo is one serving. The travel mug does not fit in my car cup holder. This is huge issue for a product whose selling point is that it doubles as a travel mug. The base of the mug is 80 mm or 3 1/18 inches in diameter and it tapers out a bit from there. 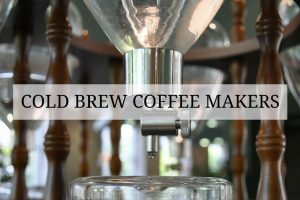 Success in cold-drip coffee is dependent on a contact time long enough to extract the flavors of the coffee, and contact of the water with all of the coffee. In principle, the water drips into the coffee grounds until they are thoroughly saturated. When the grounds reach saturation, the coffee begins to drip through into the container below. I had trouble achieving this consistently at first, but through a little trial and error have learned to take the time to thoroughly and evenly wet the grounds. Now the Dripo is my go-to method when I don’t have time for immersion. 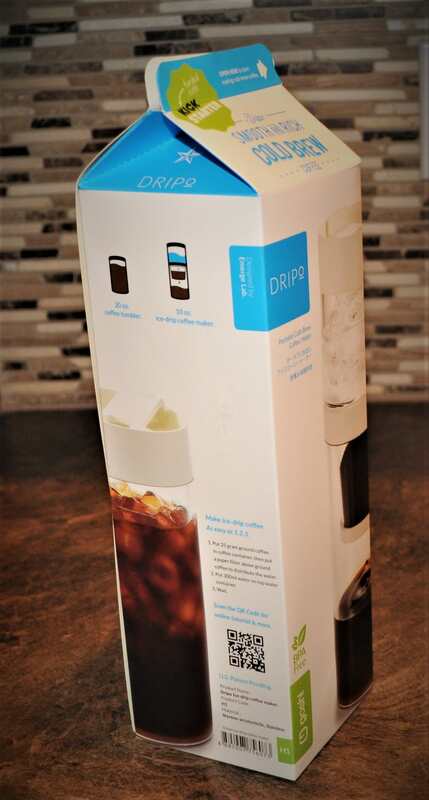 The Dripo is a nicely built and has several nice advantages (size, faster than immersion, built in mug). It also has some flaws that you need to decide if you can live with. 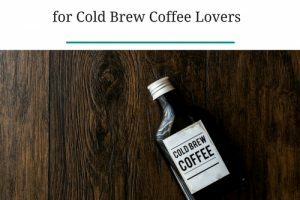 It would be nice to have some control of the drip rate—although using lots of ice and/or brewing in the fridge are two ways to slow things down. Overall, my results with the Dripo started sketchy, but once I got the hang of it, it made a beautifully smooth cup of coffee. 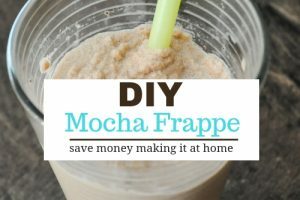 This is a great option when you need coffee but don’t have time for a full 12-24 hour immersion. You can find the Dripo at Amazon.